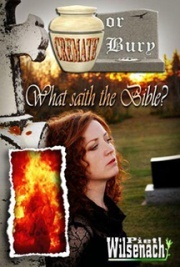 #FREE #CHRISTIAN #EBOOK > ALL DEVICES >> #KINDLE #KOBO #NOOK #IPHONE #IPAD > Cremate or Bury, What Saith the Bible? Have you ever thought about your very last decision here on earth? Will you be cremated or buried? Do you have enough information and facts to make an informed decision? If you think it doesn't matter, read this book to find out just how much it matters! The author exposes a few “dirty little secrets” of the cremation industry, which is dreadful and terrible for relatives, but vitally imperative in the reader’s decision making process. Non-Christians even find this book to be a secular treasure-trove of information related to the subject at hand. Even if you don’t believe in the bible – read this book!Brace yourself as this book will shock you!